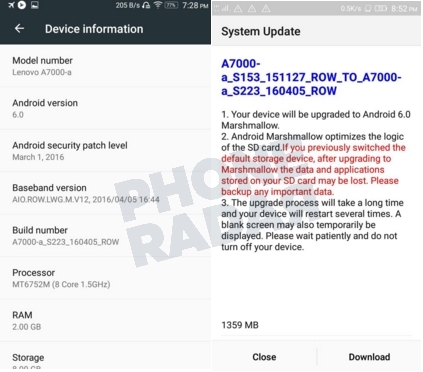 Lenovo, the Chinese smartphone maker has started to roll out Android 6.0 Marshmallow update to its mid-range handset, the A7000, in India. The brand is rolling out major software update via OTA (Over-the-Air). So, A7000 users in the country prepare to get Marshmallow love on your device. The update on the Phone also covers the Android security patch level that was released in March this year. Its welcoming that Lenovo has pushed this update to their users post the K3 Note that has recently received the same update. The complete size of this package is 1359 MB and it is recommended to the users to have at least 2GB of free space on their device before downloading the package. Do make a note that since there are chances of data loss, you should always backup all your private & sensitive information to the cloud or offline that can be restored later. We would also like to mention that since the Android 6.0 allows you to install applications on your SD Card, you need to backup all your SD Card data prior to the update. All the applications and the data might get lost according to the change log and you need to back up the important data.